The Kenyan Coast - The Indian Ocean. When I dipped my feet in I couldn’t believe how nice and warm it was. I think I was the only one in the hotel who made it into the ocean and not the hotel pools. The water in those pools was a lot cooler than the ocean, and I happen to like warm water for swimming. So that suited me just fine. I had come from Nairobi, which is at a high altitude, and was surprised to find that the weather was so much warmer on the coast. But people had warned me and I was ready for a bit of hot weather. 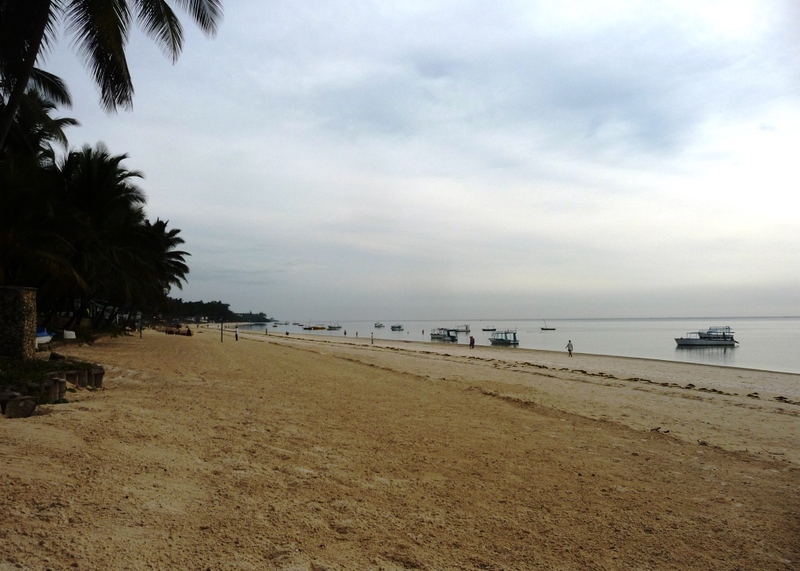 It was a little sad that I arrived in the evening and thought that I wouldn’t see a lot on the drive from the airport to the hotel, which is located a bit north of Mombasa on Bamburi Beach. But nevertheless it was a fantastic ride with many new impressions and exotic smells. 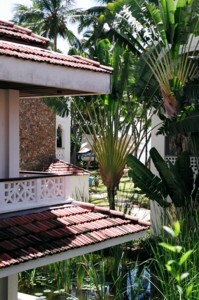 The Whitesands Beach Resort was very nice and pleasant and has a very coastal feeling. Although fairly big, the way it is designed, it gives ample room to breath and not feel crowded at all. I also came at the low season, which was another bonus as there weren't that many people there. It is right on the beach, with a big area of green grass, nice refreshing pools and chairs to sit under palm trees and watch the endless flow of people walking on the beach. 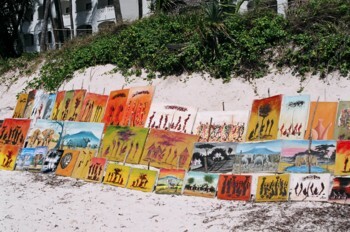 During the day the locals use the opportunity to set up their little shop stands right on the beach in hopes for a sale. It does make for a wonderful, colorful display of fabrics and wood carvings. If you would like to go on a walk along the beach, do it early in the morning or late at night. These guys tend to be very persuasive, but I also found, if they can tell you’re really not interested, they leave you alone. Most of the hotels offer water sports centers for water-skiing, snorkeling and scuba diving. 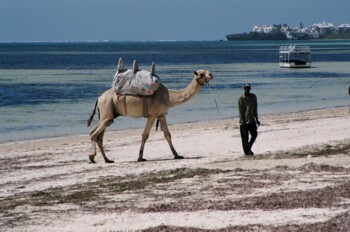 The locals propose dhow sailing trips and camel rides. 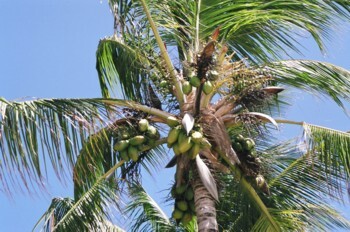 One morning the hotel staff started to work on the many palm trees and produced fresh coconuts. We asked if we can have a taste and they peeled the thick green layer and opened them for us. 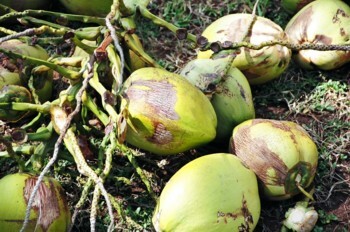 Wow, it couldn’t get any fresher than that and it was delicious. On my last morning the tide was very low and I started to wander around a little bit. A local fisherman approached me, saying that he is going to find some food for his dinner that evening and asking, if I would like to come walk out into the ocean with him. Something made me trust this guy and I agreed. It was the most amazing thing I did on this trip. With his constant ’follow me, same steps’ and making sure, that I didn’t step on something sharp, we wandered far out. It was a fascinating feeling to walk on an area that a few hours ago would have totally engulfed me with water and would again do this in a few hours time. There were all these little pools filled with sea life. We saw whole colonies of black and brown spike sea urchins, many sea cucumbers and all sorts of other little creatures. But the one thing he was looking for, lobsters, we didn’t find. He told me it’s getting harder and harder to find them, but he also felt, that the ocean was still intact there and he was happy to point out all the signs for a healthy water life. He hand picked some shells for me on our way back and they are my biggest treasure from this trip. Ready for a camel ride? Note: The best way to get to Mombasa from Nairobi is by air; there are daily flights available. There are also numerous bus companies operating between Mombasa and Nairobi with several services a day. 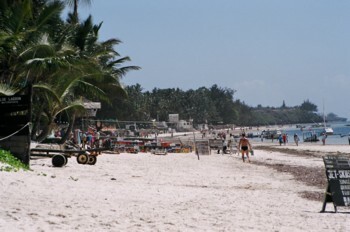 While on the Kenyan Coast why not investigate some National Parks in the area? Here are three excellent National Parks and Reserves that are definitely worth visiting.